This was brought to my attention last night from a collector who commented on my post about the 90’s having some of the best insert cards. He informed me about a card from 1990 Pro Set football cards that featured a hologram of the Vince Lombardi Trophy. These cards were considered super rare back in 1990. On the back of each card they were serial numbered out of 10,000 copies. This can give you an idea of how much overproduction took place during this time in the hobby. Its a good sign that cards are being overproduced when a rare card is limited to 10,000 copies. The funny thing is that this card is still selling pretty well considering the time it was made. A recent auction for this card sold for $65.00. Back in 1990 these cards were so popular collectors would buy boxes of this stuff by the case. 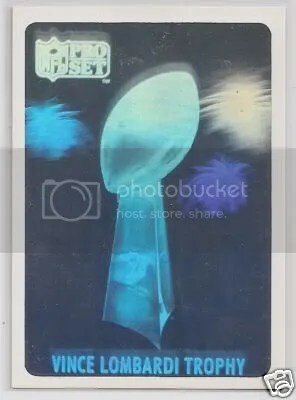 Pack searchers really came about around this time, because this card contained a small amount of metal, pack searchers would use a metal detector to find this hologram.